View Poll Results: What was your result with solenoid repair method for ABF ? There's a lot of discussion on this forum and others about the succes rate of the solenoid replacement method to fix the aperture block failure of K-30/K-50 and some other models. So far, most evidence are more or less on a case by case basis and it's difficult to establish for sure how well this method works. 1) Solenoid filing, camera works OK. The green solenoid was put out, filed, and put back in the camera. 2) Solenoid filing, camera worked for some time. Meaning that the camera worked fine after the repair but ABF reappeared or still happened intermittently. 3) Solenoid filing, failure. As 1), but the filing didn't solved the problem. 4) Solenoid replacement, camera works OK. The green solenoid was replaced by a another one. It didn't matter if the replacement solenoid was new or salvaged from another device. 6) Solenoid replacement, failure. Same as 4), but didn't fix the problem. 7) I broke the camera during the repair. This question is to evaluate how risky it is to attempt the solenoid reapair procedure. 8) California repair, camera OK. Although we don't know exactly what the guy does, AFAWK, it's similar to one of the two procedure above and can be a more convenient option for many, if not most, people. 9) California repair, failure. Either the California repair didn't worked or the camera worked but started to show ABF after some time. So, if you tried a solenoid repair on a camera with aperture block failure, please answer this poll. This would help a lot to better know if and how well this procedure really works. Thanks in advance to all of those who will answer! Last edited by CarlJF; 05-16-2017 at 11:53 AM. Ricoh agreed to fix mine, I shipped it to their designated repair shop, and I assume it'll work but I'll let you know in a week when I get it back. Sorry to the DIY guys - I didn't crack it open beforehand so I can't report on what they change. When my K-50 acted up, I removed the solenoid and degaussed the plunger (I have a degaussing coil intended for CRTs). The camera worked perfect for a couple months. Then it started to act up again. I lived with it for a bit, not anxious to get back into the camera. But it developed another problem: The mirror started getting hung up. I would have to remove the battery and cycle the power with the lens off to get the camera working again for a few shots. So, I took the camera apart and noticed a spring behind a gear had come out of place. I took the mechanism apart to fix it, but dropped a different spring somewhere in the camera! It won't come back out, so the camera is now a brick. There's only so much you can do without a service manual. Too bad, because it was a great camera. I have a used K20D coming next week. I thought about switching brands because of this. I mean, the camera is only 3 years old. But I'm an electronics technician and I know darn well every brand has it's issues. I didn't vote, because I don't know where this fits in! I tought to add a "repair shop" or "repair under warranty" option but I decided not to because it's often not very clear as to what they have done or what procedure they follow. They may have repaired a camera, but this also might not have much to do with the DIY solenoid repair that is the subject of this poll. But when your camera will be back, if by any chance the shop gives you a detailed report on what they have done and you find out they have replaced the soleoid, you could still answer the poll since there's no time limit on it. No worries. I figured it could be relevant if the point of your poll was to discover the ideal repair path after failure, though you're right that it's not terribly helpful if you're hoping to discover the technical cause of the failure (and neither is the California repair). I'll let you know if I learn anything. White made in Japan Solenoid versus green Made in China Solenoid. 4) Solenoid replacement, camera works OK. The green solenoid was replaced by a another one (green or white). It didn't matter if the replacement solenoid was new or salvaged from another device. I believe that it does matter very much which solenoid was used. In Germany we have the first reported failure of a K30 which got it's green solenoid echanged (on warranty officially by Ricoh). Just after the 1 year warranty it failed again. OK, I've corrected the description and remove the "green or white" reference. The goal here isn't to get too deep in the specifics but to get a better idea of the repair. If people feel the need to add specific details, they can add always add a comment. BTW photogem, in the other thread I noticed to you repaired multiple camera. Were you able to enter all of these repairs in the poll or limited to one ? I voted but could only vote once (for 1 camera). Attached photo of 4 damaged solenoids (3 x K30, 1 x K50), the 5th (element) went to the bin. All 5 green solenoids have their horseshoe "sticking stronger", moving it out of the main body needs more force. 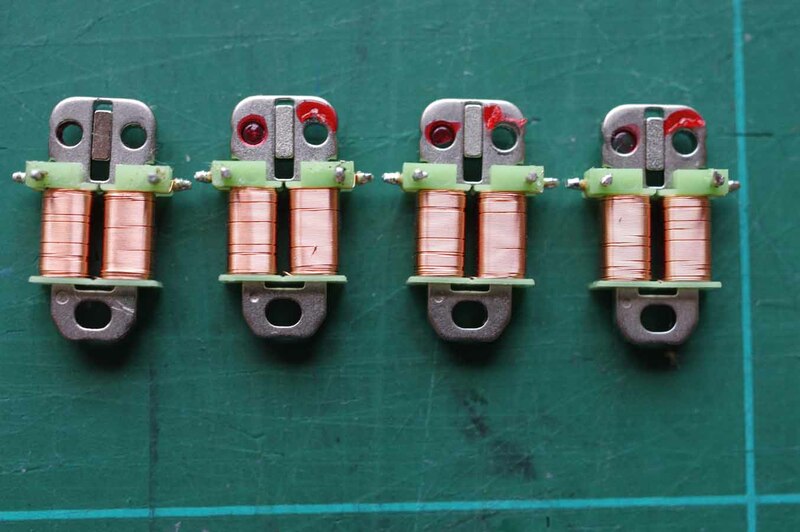 Also all green solenoids have more play for the horseshoe, i.e. the horseshoe can easier jam! Anybody undertaking this task: IMO it is way the easiest to unsolder the 2 wires directly on the solenoid when it is still in the body. directly at the pins of the solenoid and quickly "touch them with the soldering-iron tip", a very short touch is enough to remelt the solder which then should harden without moving the wire. Then a test with some tweezers to make sure the wires hold tight on the solenoid. IMO much saver than unsoldering the wires at the other end.